(Bloomberg) -- Japanese shares have fallen behind most of their developed-market peers this year, but Goldman Sachs Group Inc. says the risk reward for the world’s third-largest stock market is “relatively favorable” in the new fiscal year. 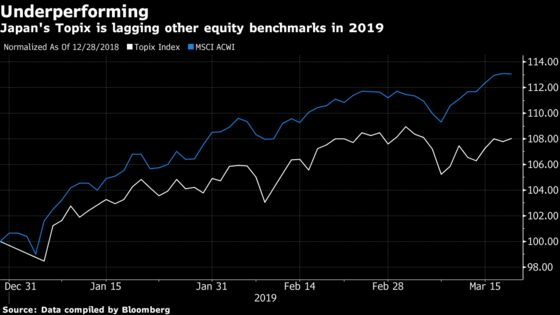 The Topix index is up 8 percent so far this year, lagging all developed stock benchmarks except for those in New Zealand, Israel and Singapore, according to data compiled by Bloomberg. Weak global demand has weighed on Japan but a recession is unlikely given more stable capital expenditure and consumption, Goldman says in a March 20 note. The firm lifted its 3-month and 12-month targets for the Topix to 1,650 and 1,675, respectively, and raised earnings growth estimates for the next financial year, as it cut projections for fiscal 2018. Goldman raised its EPS growth estimate for Japan to 5.6 percent from 3.1 percent previously, assuming a foreign-exchange rate of 105 yen per dollar. It cited “continued, albeit more subdued” earnings growth, supportive valuations, progress in the labor market, corporate governance reforms, corporate buybacks, and the Bank of Japan’s stock purchases for reasons behind the anticipated strength in Japanese equities in fiscal 2019. Appetite for Japanese equities have yet to pick up, however, with foreigners continuing to net sell local stocks in the cash market. Foreign investors have offloaded a net 1.5 trillion yen of local equities this year through to March 8, according to data from the Japan Exchange Group. Matsui also highlights China as a potential risk factor. “Since Japanese equities remain highly sensitive to the global economic cycle, the outlook for Japan’s most important export markets -- China and the U.S. -- as well as the outcome of trade talks will be critical determinants of the market’s direction in FY19,” she said. Investors have cut their allocations of Japan stocks to 3 percent overweight from 10 percent as China growth concerns remain, according to a recent survey from Bank of America Merrill Lynch.